China, 1934 B/W – 75 min. Silent. Shanghai, the thirties. A young single mother is forced to prostitute herself in order to feed and educate her child. Running from the police she ends up getting involved with a gangster, who exploits her by threatening the child. Their life together becomes hell; their neighbours do not allow their own children to play with the son of a morally corrupted woman and the school's dean receives several letters demanding that he should expel him. 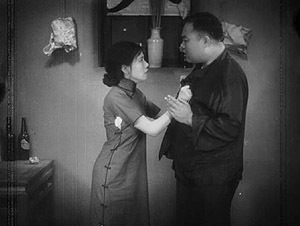 Shennü was the penultimate film by Shanghai silent film's star Ruan Lingyu, before she committed suicide ate the age of 24, following a disturbed sentimental life and the press and society's reproach on her life style. 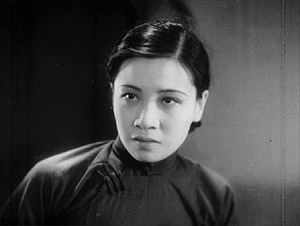 The journalists increased their attacks after the film New Woman/Xin Nuxing (1934), a biography of actress Ai Xia, who committed suicide due to the way she was constantly portrayed on the tabloids. Fate's tragic irony would place Ruan on a similar path. The first sound picture was The Jazz Singer (USA, 1927) and the Shanghai's dynamic film industry was preparing to include sound in its films, which was somewhat feared by those actors with strong accents and more fluent in dialects other than Mandarin. Meanwhile silent films remained very popular and took an advantage from the fact that the American sound production — due to the language factor — could not compete locally. 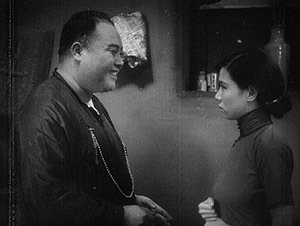 The Lianhua Studio produced films both pro and against the establishment, being inevitable that the too “progressive” ones would suffer the scrutiny of Chiang Kai-shek regime's censorship. The melodrama, although still allowing for some hidden political subtext, was a popular and rather safe one. Ruan Lingyu became a star with roles associated to the modern Chinese woman — strong, independent and self-assured, fighting social prejudice. The "Goddess" prostitutes herself in order to raise her child. A hoodlum makes her life even harder. The film does not seek to develop around the sympathetic character, the (today's) typical “prostitute with a heart of gold”, but it rather does intend to make a social analysis of the current times, based on the situation of a woman forced to extreme actions in order to survive, sacrificing herself at any cost to give her child some kind of a future. She can expect nothing of life and society rejects her; she forgets herself and gives her body and soul to her one and only hope: her son. It is the city of Shanghai itself that comes out as the villain in the film, rather than the gangster played by actor Zhang Zhizhi, mainly through several inserts, pictures of modernity, depicting a sleepless city — tall buildings in the night and bright neon lights. 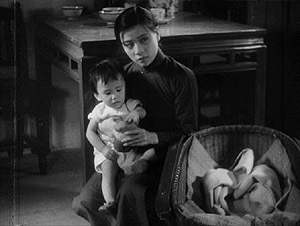 At one point in the film, Ruan looks at the Shanghai night and, before her son, expresses the wish to run from the city (and its society) that does not allow her to lead a normal life. 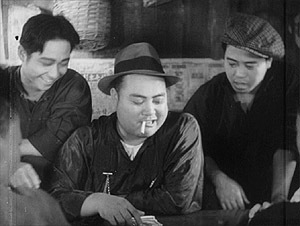 The gangster (Zhang Zhizhi) exploits the "Goddess" and spends the money on gambling. Although we are before a film over seventy-years old, some of the directorial ideas still surprise us. Functional framing and camera movements increase the dramatic impact of some scenes, such as when Ruan attacks her assailant, approaching the camera, her eyes filled with determination. In spite of the original material being very deteriorated, the use of light and contrast, best applied in black and white, strongly contribute to enrich this cinema experience. It is obvious that the technical aspects have not been ignored. It is hard to judge an actor by just one film, but here Ruan shows that she was not a star that only filled the newspaper pages due to her sentimental life; she was also an excellent actress who got consumed by the very roles she played. It should not be difficult to deduce that the tragedies in her personal life greatly contributed to her performances relating to characters that were also victims of the society in which they lived. It is a pity that Ruan came to reveal herself much more emotionally fragile than her characters and that we were not able to see and hear her in sound cinema. (1) The book by Richard J. Meyer, apart from Ruan Lingyu's biography, also depicts a portrait of the times in which the actress lived, enabling us to understand better the context in which this and other films were produced. 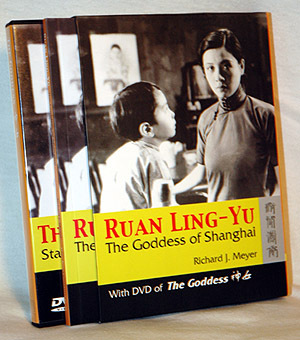 "Ruan Ling-yu The Goddess of Shanghai", book and DVD. The DVD by the Hong Kong University Press is targeted for the global market: region free and dual-sided, allowing to choose from PAL or NTSC versions. It includes a 16 minutes piece hosted by Richard J. Meyer, responsible for the film restoration and the author of the book included in the pack. The book is 94 pages long and includes 49 black-and-white pictures. This edition may be acquired from the several Amazon sites, the HKUP European representative, Eurospan, or the San Francisco Silent Film Festival site. The French Amazon seems to be the more economical choice for Europe but not the quickest one. Please note that the first release included only the DVD. In spite of the restoration, the filmstrip shows a great amount of deterioration and defects. Nevertheless, it still enables you to enjoy the film.